In crystal oscillators, the usual electrical resonant circuit is replaced by a mechanically viÂ­brating crystal. The crystal (usually quartz) has a high degree of stability in holding conÂ­stant at whatever frequency the crystal is originally cut to operate. The crystal oscillators are, therefore, used whenever great stability is needed, for example, in communication transÂ­mitters, and receivers, digital clocks etc. A quartz crystal exhibits a very important property known as piezo-electric effect. WhenÂ a mechanical pressure is applied across the faces of the crystal, a voltage proportional toÂ the applied mechanical pressure appears across theÂ crystal. Conversely, when a voltage is applied across the crystal surfaces, the crystal is distorted by an amount proportional to the applied voltage. An alterÂ­nating voltage applied to a crystal causes it to vibrate at its natural frequency. Besides quartz, the other substances that exhibit the piezo-electric effect are Rochelle salt and tourmaline. Rochelle salt exhibits the greatest piezoelectric effect, but its applications are limited to manufacture of microphones, headsets and loudspeakers. It is because the Rochelle salt is mechanically the weakest and strongly affected by moisture and heat. Tourmaline is most rugged but shows the least piezo-electric effect.Â Quartz is a compromise between the piezoelectric effect of Rochelle salt and the mechaniÂ­cal strength of tourmaline. It is inexpensive and readily available in nature. It is mainly the quartz crystal that is used in radio-frequency (RF) oscillators. For use in electronic oscillators, the crystal is suitably cut and then mounted between two metal plates, as shown in fig (a). Although the crystal has electro-mechanical resonance but the crystal action can be represented by an electrical resonance circuit, as shown in fig. (b). The crystal actually behaves as a series R-L-C circuit in parallel with CM where CM is the capacitance of the mounting electrodes. Because the crystal losses, represented by R, are small the equivalent crystal Q is high-typically 20,000. Values of Q upto 106 can be obtained by making use of crystals.Â Because of presence of CM, the crystal has two resonant freÂ­quencies. One of these is the series resonant frequency fs at whichÂ 2 âˆfL = 1/2 âˆfCÂ and in this case the crystal impedance is veryÂ low. The other is parallel resonance frequency fp which is dueÂ to parallel resonance of capacitance CM and the reactance of the series circuit. In this case crystal impedance is very high. The impedance versus frequency curve of the crystal is shown in figure. 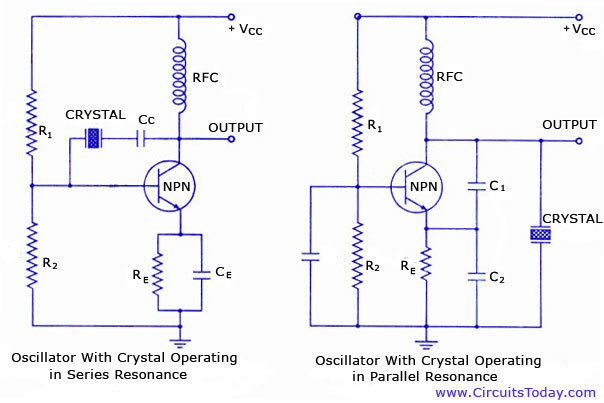 In order to use the crystal properly it must be connected in a circuit so that its low impedance in the series-resonant opÂ­erating mode or high impedance in the anti-resonant or paralÂ­lel resonant operating mode is selected. Two resonant frequencies are given by the expressionsÂ Series resonant frequency, fs = 1/2 âˆâˆšLC Parallel resonant frequency, FP = 1/2âˆâˆš[1 + C/CM] / LC It appears that fp is higher than fs but the two frequencies are very close to each other.It is due to the fact that the ratio C/CM is very small.To stabilize the frequency of an oscillator, a crystal may be operated at either its series or parallel resonant frequency. To excite a crystal for operation in the series-resonant mode it may be connected as a series element in a feedback path, as shown in figure. In this mode of operation the crystal impedance is the smallest and the amount of positive feedback is the largest. Resistor R1, R2 and RE provide a voltage-divider stabilized dc bias circuit, the capacitor CE provides ac bypass of the emitter resistor R^ and the radio-frequency coil (RFC) provides for dc bias -while decoupling any ac signal on the power lines from affecting the output signal. The voltage feedback sigrTal from the collector to the base is maximum when the crystal impedance is minimum (that is, The series-resonant mode). The coupling capacitor Cc has negligible impedance at the circuit operating frequency but blocks any dc between collector and base. The circuit shown in figure is generally called the Pierce crystal. The resulting circuit frequency of oscillations is set by the series resonant frequency of the crystal. Variations in supply voltage, transistor parameters, etc. have no effect on the circuit operating frequency which is held stabilized by the crystal. The circuit frequency stability is set by the crystal frequency stability, which is good. 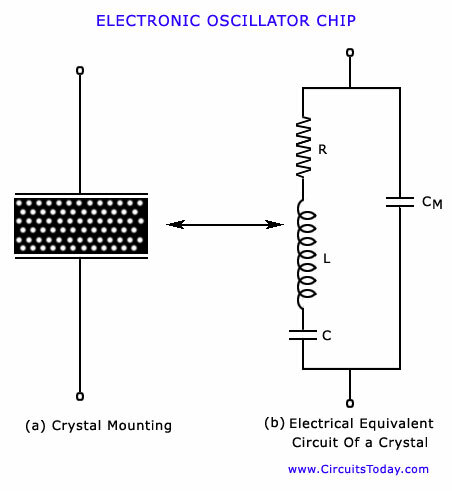 Crystal oscillators must be designed to provide a load capacitance on the crystal as per specifications listed by the manufacturer. This requirement is essential for obtaining oscilÂ­lations at the specified frequency. It is also important from the point of view of limiting the power supplied to the crystal to the specified maximum. Too much crystal power causes distortion in the oscillator waveform. It also causes overheating of the crystal, consequently rendering the resonant frequency unstable. More important is that the thin-plated electrodes may be melted off an overdriven crystal, destroying the device. Typical maximum drive levels for plated crystals varies from 2 m W to 10 m W.
The maximum permissible drive power limits the ac voltages that may be applied across the crystal and consequently affects the design of oscillator circuits. Crystal manufacturers usually specify the resistance of individual crystal, as well as maximum drive power. From these two, the maximum crystal ac voltage may be determined by using the relation P = V2/R.